A hanging basket lowered from an apartment window. 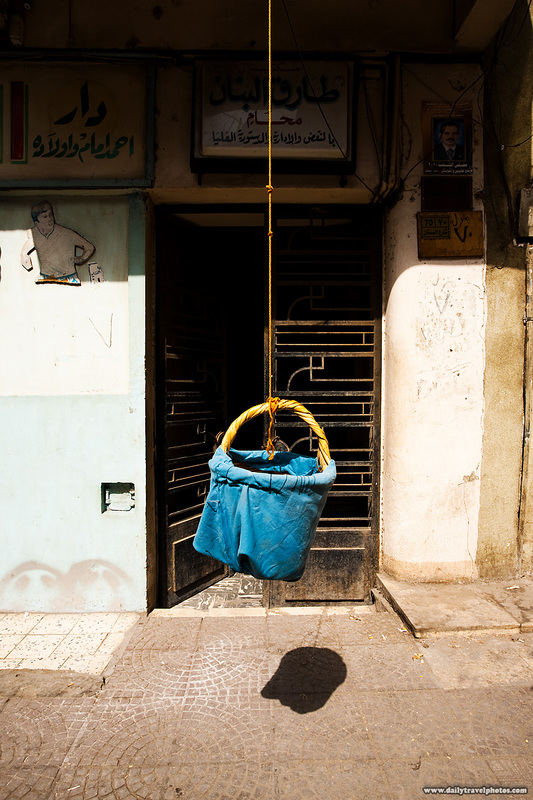 All over Cairo, you see these dangling basket obstacles impeding the sidewalk. The purpose wasn't clear to me until, finally, I saw a bread delivery guy slip a shipment to be raised back to the apartment above. Essentially, it's a primitive dumbwaiter used for anything that can be tossed inside (rice, newspapers, etc.) and although I haven't seen it, I'm certain in Egypt's recent history, some lazy parent has slid his baby in for a multi-floor ride. Frankly, I don't blame them... particularly if you're familiar with the rickety unmaintained elevators most apartments use to access the higher floors. 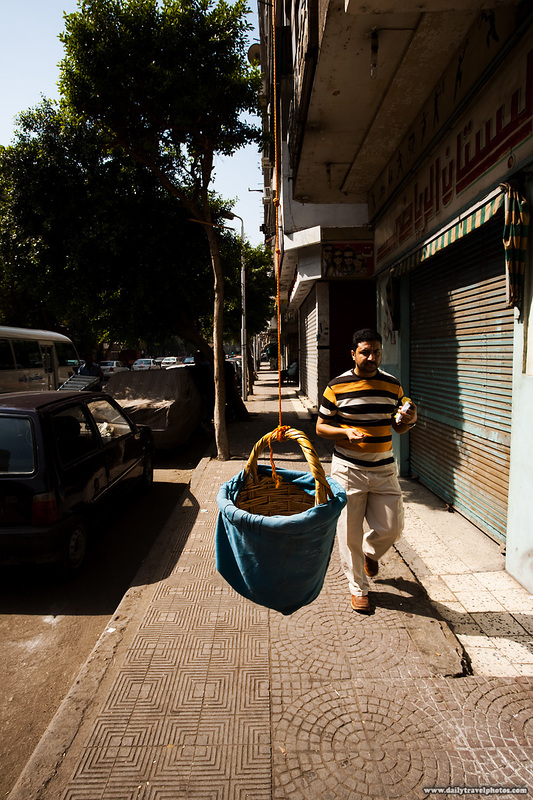 An Egyptian man walks by a hanging delivery basket on a narrow sidewalk. The size of the sidewalk above is atypically wide and uncluttered for a typical Cairo street. Due to large amounts of strewn objects on the sidewalk and makeshift motorcycle parking spots, people tend to brave the chaotic traffic and walk directly on the street, itself. However, you can imagine if this sidewalk were cluttered, how difficult it may be to avoid these obstructions. Add the possibility of several hanging bread baskets and you'll see why most Egyptians prefer near-death by oncoming traffic than dodging random objects on the sidewalk.